When I was still planning the site, there was no question that I had to use WordPress. The open source blogging platform fits my need for a lean but feature-packed CMS I can use to run Tugkaran without the hassles of manual publishing—writing copy, laying out web pages, editing links, uploading these to the site and repeating the cycle for every iteration. 1. I am the only person updating the site. I write all the copy and post all the articles myself. If somebody else from the team writes something, I still need to go over it before the article gets published. Using Drupal for the site would be like using a pneumatic power drill when all I needed was to tighten a screw on a picture frame. 2. I find it easier to take control over the behavior of a WordPress-driven site than one run by Drupal. 3. I work faster with WordPress than with Drupal. 4. I find it easier to design a WordPress theme than a Drupal template. The blocks module of Drupal makes it easy to add snippets of content into your site and customize not only their display but specify on which nodes or node types they will appear in. With WordPress, I can do that while lightening the load on the server by directly editing the .php template files to do away with database queries for displaying blocks of content. I’m sure there’s a way to do this in Drupal that I haven’t learned just yet. 5. It’s easier to update WordPress to the latest release. I don’t want to spend a lot of time in the upgrade process for a site that I will be rarely updating. For someone with several online notes repositories and TiddlyWikis, I’m still a paper-and-pen-or- pencil type of guy. For certain tasks, nothing beats doing it on paper and ink. The initial stage of planning a site is among these tasks. I use Konigi’s graph paper to let clients communicate what they want for the website. For Tugkaran, I only needed a quick sketch of what I wanted because the basic design was already percolating in my mind for weeks. I neither have the patience nor the skills to create web layouts that work across major browsers. With CSS frameworks like Yahoo UI Grids and CSS, creating multi-column layouts is just a matter of clicking buttons to build your page. In working with web designs, nothing beats Aptana Studio as tool. I used to work with Dreamweaver, which you can use to edit WordPress themes, but when I found Aptana, I never looked back. Not only is Aptana free, it’s also a great tool to work on your site’s HTML and CSS codes and get instant previews of the design. It does much more than that, but that’s basically how I use it. Another great text editor. While I alternate between Gedit and Bluefish, I used Bluefish exclusively for this project because of the code snippets that come with it. Aptana Studio now has code snippets in its code editor but I prefer Bluefish’s implementation. I sketched my website plan in Konigi’s Wireframe with notes graph paper. I wanted Jon’s Smooth Gallery as centerpiece of the home page. The gallery will cycle through articles I wanted to highlight. I then created a basic layout of the site using Yahoo UI Grids Builder. The tool makes it easy to design a basic web page layout pages and specify such things as its width and whether it is fixed or fluid; and the number of columns and rows. 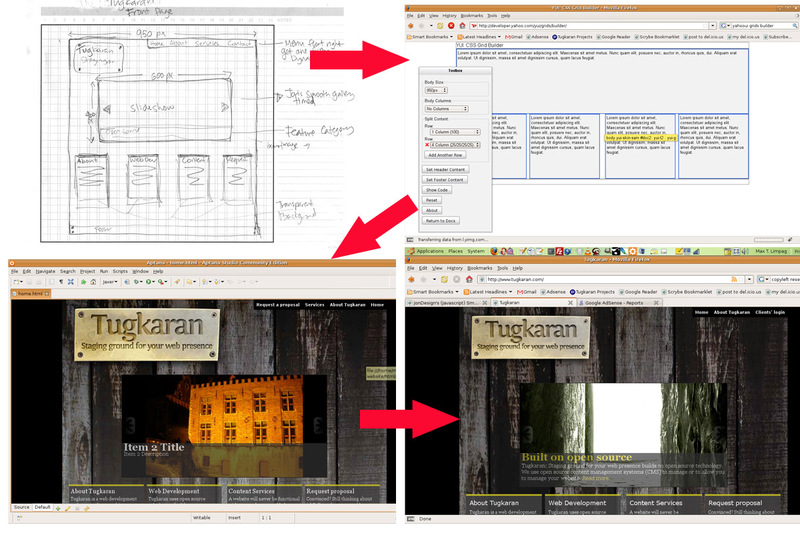 I configured just one page because my plan for the Tugkaran site is that individual pages will have the same layout as the home page–single column in the main content area with four columns under it. I see no need for a sidebar to the main content but if I decide later that I wanted a sidebar, that would be easy to add using the Grids Builder. The advantage of using Yahoo UI Grids for your layout is that it offers a lot of page layout combinations with A-grade browser support. You don’t have to worry about the layout being broken in browsers like Internet Explorer—although I make it a habit to check my final HTML design in Explorer. If you use Yahoo UI Grids, you can choose to have the CSS file hosted in Yahoo. Don’t worry about upgrades breaking your layout, the CSS file path given to you for embedding in the header is version-specific. After getting the website layout code from Yahoo UI Grids Builder, I then edited this on Aptana. This file is used for the home page. The layout contains the Smooth Gallery script that pulls content from my Features category (more on this later). After finalizing the HTML layout, I stripped it of reusable elements (header, footer) and then saved it as home.php. In displaying your home page, WordPress looks for a home.php template file and if it can’t fine one, it uses the index.php file. I created a single.html to plot the layout of individual article pages as well as the site’s fixed pages such as the About page. The single.html page is just the home page without the Smooth Gallery code. Description: WordPress theme for Tugkaran website. I then looked into which parts of the pages can be reused. The obvious choices are the upper part for the header and the bottom section for the footer. I then marked the the sections in the HTML code to make it easier for cutting up in Bluefish, where I will be working on the individual WordPress template files. I decided to use the four columns in the bottom row as part of the footer because I wanted these displayed in all pages. I then looked around for a CSS menu that I can add to the page and found Matt Black Tabs in Dynamic Drive and incorporated it into the design. After finalizing my HTML design, I then used Bluefish to cut it up into the different .php files that make up a WordPress theme. I cut the codes in the header section, added <?php wp_head(); ?> and saved the file as header.php. The <?php wp_head(); ?> needs to be inside the element. It is used by some plugins. I then cut the codes in my footer section, added <?php wp_footer(); ?> and then saved the file as footer.php. All that was left in my home.html file was the code for the Smooth Gallery. I added <?php get_header(); ?> at the start of the file to call the contents of header.php and added <?php get_footer(); ?> at the end of it to grab the contents of footer.php. 1.Gets articles in category 3, my Features category, and displays the last 5 articles in that category. 3.Grabs the image I designated in the custom fields as “banner image” and then displays it as part of the slideshow. I just uploaded a 600px by 300px image in WordPress’ post editor, grabbed the full URL path for the image location and entered the URL as “bannerimage” custom field. I no longer bothered creating a comments.php file because I turned off commenting since I just wanted the site to showcase Tugkaran’s services. I also didn’t create an archives page. My custom theme only has 8 files: style.css, home.php, index.php, single.php, page.php, header.php, footer.php, and 404.php. But this could even be fewer. I can, for example, do away with single.php and page.php nad just let index.php do their jobs. After I finished creating the template files, I then uploaded these to the server and fixed errors that I encountered. I will be redesigning the site. I still don’t have time to do it, however, and will have to put off the redesign at least until the week after next. I might go over the design again this weekend to fix an error on the rendering of transparency in individual pages in Explorer. If you spot errors or have suggestions on improving the design, feel free to leave a comment in this post. If you want to go over the files I created in building Tugkaran, you can download the initial HTML files here and the final WordPress theme here. A warning, these files were hastily done and I didn’t have the time to clean these up so you might find an image that is no longer in use or code snippets that were abandoned. The whole thing is released on copyleft, with all wrongs reserved 🙂 . You can do with it whatever you want. If you want to link to me, I’ll be more than happy. If you don’t want to add a link to my site, it’s also perfectly fine with me. But if you spot errors or have suggestions on how to improve the theme, leave a comment below. WOW! Very good thoughts here. Never heard of YUI before, but dag if I’m not going to try that tool out. Looks very clever. I’m working on a handful of WP designs as we speak – so this tool may be very helpful. Tell us what you need by requesting for a proposal should read requesting a proposal. Saw it – shared it. You made a rather significant contribution with this piece to the widening circle of people who want or need to understand WordPress. There are tutorials galore, books, but nothing like what you offered here. Rather than merely lecture, you present yourself as an experienced coach bringing a new co-worker up to speed. This is five-star quality!! Thank you, thank you very much. Wonderful article! That is some serious rapid wordpress development! I also developed a custom theme for my blog. Your post gave me an idea of what to write next. Thanks and keep it up. The fact that you used all open source software from start to finish just goes to show how mature these tools have become. Great proof-of-concept, nice site! I’m sure this article will be a very helpful resource for others. Thanks for sharing this! i really, really like the new layout with the moleskine and coffee and post-it. it’s so cool. I really love your blog since i stumble here with the drupal tips.. i always find your site in my inbox to check you new entry. I found your blog very resourceful and very powerful. hutdan mn ta english ani..
this is my 2nd idol blogsite from cebu in terms of design but in terms of info. your my number 1.
thanks sa tutorial and tips.. It was great reading about your wp theming process. Very detailed. I’ll be sure to check out your theme. Keep these tutorial coming! wow…nice article. Actually, I’m still newbie in making wordpress template. I’ve never used YUI, I think from now on, I must consider to use it.